May 4, 2018 Tiger Talk! First, let me thank all of you in our school community for your love and support during these last weeks as we said goodbye to Father Nick. We appreciate all the kind words and gestures that you have given to us. Your children created some of the most beautiful drawings, poems, and letters I have seen as their way of saying goodbye to Father. If you have not had a chance to see them yet, please stop by the Ballad Room and look at the memory board we have created for their work. The month of May begins a very busy time here at St. Anthony’s. While the school year moves closer to the end, we have so many upcoming events that it seems we never stop moving. This Saturday, our 2nd Grade class will celebrate the Sacrament of Holy Eucharist. The students have worked very hard to prepare themselves for this blessed event. If you are able to join us, please do. Mass begins at 10:00 A.M.
Wednesday, May 9th is our annual May Procession. This event is one of our most honored traditions with our graduating 8th Graders making up our May Court and one of our 2nd Graders being our crown bearer. This reverent event begins at 2:00 P.M. with the students processing from the school to the Church. If you would like to send in flowers for the altar, please do so on Wednesday morning. All are welcome to attend! Please remember for May Procession that no summer uniforms may be worn. No shorts are permitted and boys in 6th – 8th Grade must wear a button up shirt and tie. Field Day will be on Wednesday, May 16th. All students are to wear their gym uniforms. Lunch will be provided that day. If your child does not eat hot dogs, please be sure to send a lunch in with them. Congratulations to our April Students of the Month! 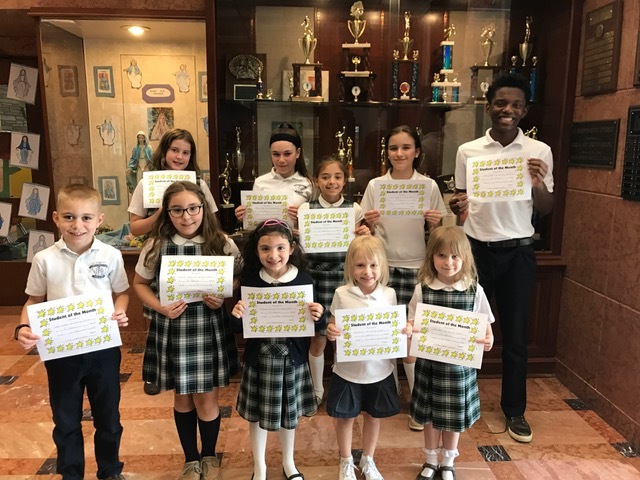 April’s virtue was “justice.” Congratulations to Duke Tayler (PK3), Molly Turner (PK4), Sylvie Keen (K), Giavanna Di Donato (1st), Chase Willard (2nd), Cecilia Ramos (3rd), Rosie Davidson (4th), Alyssa Ceresini (5th), Jessica Rieger (6th), Olivia Segeda (7th), and Amari Mathis (8th)! Keep up the good work! Congratulations to former students, Ellen Banker and Nate Thomas! Ellen and Nate are both high school seniors and they received the St. Francis de Sales Award from the Diocese. The award is presented to seniors in Catholic high schools and recognizes them for excellence in faith development, scholarship, service, leadership, and citizenship.
. Check the site often as we continue to add content to it! May Parish Monthly Social – Our next parish social will be held on Sunday, May 6th in the Ballad Room of the Grade School, following the 9:00 A.M. and 11:00 A.M. Masses. Stop by for food, fun, and socializing with fellow parishioners and friends. The social, as always, will feature a variety of great treats from Serpe’s Bakery, delicious breakfast pizzas from Degnars’ Greenhill Deli, and a variety of other foods. 2018 Italian Festival: Volunteers Needed! – It’s that time of year again! The region’s largest Italian-American cultural event, and the primary fundraiser benefitting our GradeSchool, is running Sunday, June 10th -Sunday, June 17th! Volunteers are essential to the Festival’s success. It’s a fun and very fulfilling way to support our school and parish, and to be part of a treasured community tradition. Of course, without volunteers, there is no Festival! No special skills or experience needed—everyone is welcome to volunteer! Check out volunteer opportunities at the Festival website: www.stanthonysfestival.com, & click on the Sign up To Volunteer Online link on the upper right of the home page. Then follow instructions on that page to our online signup link. Grade School families are expected to volunteer 15 hours for the Festival. In addition to the online signup option, refer to information that was sent sent home with students regarding the volunteer assignment/sign-up process. School families may sign up either online or by completing & returning the paper signup form. May 5th – First Communion – Church – 10:00 A.M.
May 7th – Student Council Meeting – PreSchool – 3:00 – 3:30 P.M.
May 9th – May Procession – 2:00 P.M.
May 10th – Kindergarten Field Trip – Playhouse – 9:00 A.M.
May 15th – Barnes and Noble Night – 4:00 P.M.
Salesianum/Padua Visit – 1:30 P.M.
YAC Meeting – Ballad Room – 6:00 P.M.
Home and School General Meeting/Elections – Ballad Room – 6:30 P.M.
April 20, 2018 Tiger Talk! Our school and parish community is mourning the passing of Father Nick as his time here on Earth has ended. Father Nick dedicated his life to the betterment of all those around him in his parishes and schools. While we are saddened that he is no longer here with us on Earth, we should be joyful that he has gone to be with God, Jesus, and all the saints in heaven. That was Father Nick’s ultimate goal: to spend his eternal life with the Lord he loved so much. School will be closing at noon on Wednesday, April 25th so our staff may gather together to celebrate Father Nick’s life and the impact he had on all of us here. Please be sure to pick your children up promptly at noon. There will be no aftercare this day. If you are able, please join us at the Mass of Christian Burial. School will be closed Thursday, April 26th to allow our school and parish community to celebrate Father Nick’s life by attending the services in Childs, Maryland. Viewing – Wednesday, April 25th – St. Anthony of Padua Church –2:00 – 6:45 P.M.
Mass of Christian Burial – Wednesday, April 25th – St. Anthony of Padua Church – 7:00 P.M.
Internment – Thursday, April 26th – Oblate Community Cemetery (Childs, MD) – 10:00 A.M.
Friday April 27th is the midpoint of the third trimester. Please review PowerSchool to check your child’s status. Zeros entered indicate missing assignments. In middle school this is crucial, as it will affect the final grade. Congratulations to our 7th Grade Math League Team! The team won 1st place in the region. Andres Lorenzo won 1st place individually in the region. Way to go! Thank you to Mrs. Tannenbaum and Mr. Limmina for your amazing leadership! Annual Giving Fund/Book Bills – This invoice went out in last week’s Wednesday folder. Please be sure to remit payment by May 4th. We ordered a new Science curriculum this year and plan to order a new Social Studies series for the upcoming year. We keep all of our curriculum current, and we count on your support to remain academically rigorous. Also, remember that your Annual Giving Fund is fully tax deductible! PreSchool 3 is working on Mothers’ Day crafts for their Mothers’ Day breakfast. They are learning the letter W and are very excited to get to the letter Z! PreSchool 4 is on the letter Z this week. They have completed the entire alphabet! They will be working on numbers and sight words for the next few weeks. They are also enjoying learning about computer science from their friends at the University of Delaware. This week they learned about functions and how computers follow directions. Kindergarten is learning about wind and went outside to fly pinwheels and self-made kites. In Math, they are learning about measuring capacity, weight, and length. 1st Grade has been learning about “r” controlled vowels in Reading. They enjoyed dancing to the Bossy R Workout and making pirate treasure chests using “ar” words. In Social Studies, the children have been discussing ways they can help the Earth, and they made a special “I Love the Earth” project for Earth Day. 2nd Grade has mastered double digit addition with regrouping! They are moving on to subtraction with regrouping. They are also working hard to prepare for making their First Holy Communion. 3rd Grade Science has been studying plants. They grew pinto beans, participated in the Delaware Forest Service Annual Arbor Day Poster Contest. They will be receiving free loblolly pine seedlings to take home and plant. 4th Grade has been adding and subtracting fractions with like denominators. They started by using fraction strips, and most have graduated to doing the problems without them. They have also been free drawing their own United States map and labeling it with the states and capitals. 5th Grade just finished reading Number the Stars. Students are working on creating a TV interview between two main characters. They will be filming the interviews with their iPads. In Social Studies, they are starting to learning about how the American Revolution began, as well as planning their diorama projects. 6th Grade has been learning MLA research writing and formatting. The students have been keeping a portfolio of all their work and handouts. In Social Studies, they just finished working on Greek culture and are moving on to the rise of Christianity. 7th Grade recently finished a Math unit on probability and statistics. Using a data set, students made and analyzed stem-and-leaf plots, frequency tables, line plots, box-and-whisker plots, tree diagrams, circle graphs, line graphs, histograms, and scatter grams. 8th Grade is reading Our Town by Thornton Wilder. We are enjoying taking turns as the assorted characters. This week will start project #1. Music – The excitement is building as the students in 5th through 8th Grade are learning to be composers of music. The free program called Musescore 2 is a superb learning tool and outlet for creativity. The young composers have been learning about adding instruments and creating bass lines for the melodies they create. Come join the fun on Friday, April 27th for Designer Bag Bingo – Bingo will be held here at the school in our Gymnasium. Doors open at 5:30 P.M. with games beginning at 7:00 P.M. Tickets cost $25, and include 20 games and 1 raffle ticket. All proceeds benefit St. Anthony of Padua Grade School. You are welcome to bring your own snacks and non-alcoholic beverages. Light snacks and drinks will be available for purchase. May Parish Monthly Social – Our next parish social will be held on Sunday, May 6th in the Ballad Room of the Grade School, following the 9:00 A.M. and 11:00 A.M. Masses. Stop by for food, fun, and socializing with fellow parishioners and friends. The social, as always, will feature a variety of great treats from Serpe’s Bakery, delicious breakfast pizzas from Degnars’ Greenhill Deli, and a variety of foods. 2018 Italian Festival: Volunteers Needed! – It’s that time of year again! The region’s largest Italian-American cultural event, and the primary fundraiser benefitting our Grade School, is running Sunday, June 10th -Sunday, June 17th! Volunteers are essential to the Festival’s success. It’s a fun and very fulfilling way to support our school and parish, and to be part of a treasured community tradition. Of course, without volunteers, there is no Festival! No special skills or experience needed—everyone is welcome to volunteer! Check out volunteer opportunities at the Festival website: www.stanthonysfestival.com, & click on the Sign up To Volunteer Online link on the upper right of the home page. Then follow instructions on that page to our online signup link. Grade School families are expected to volunteer 15 hours for the Festival. In addition to the online signup option, look for information that will be sent home with students regarding the volunteer assignment/sign-up process. School families may sign up either online or by completing & returning the paper signup form. Thanks to everyone for your continued support! Italian Festival 8-Day Passes & Gift Cards Now Available—PRE-FESTIVAL SALES PRICES – Passes are a great gift for graduation or any occasion! Gift cards are the perfect gift for Moms, Dads, grads—everyone. They are also a smart way to provide funds to the kids for use at this year’s Festival. BUY NOW & SAVE!! $12.00—20% OFF price is purchased at the Festival ($15.00). Looking for an Inexpensive Way to Promote Your Business? Would you like to reach the tens of thousands of people who attend the Italian Festival? Consider a banner advertising on our perimeter gate. It’s an easy and affordable way to spread the word about your business! For more info email us at: festival@stsnthonynet.org or send a message to the Festival Facebook page (facebook.com/stanthonysfestival). April 23rd – Student Council Meeting – PreSchool – 3:00 – 3:30 P.M. Designer Bag Bingo – Gym – 7:00 P.M.
May 4th – First Communion Practice Mass – Church – 8:00 A.M.
May 21st – Student Council Meeting – PreSchool – 3:00 – 3:30 P.M.
April 6, 2018 Tiger Talk! I hope everyone had a beautiful and peaceful Easter Break. Things have been very busy around here. I hope you are following us on Facebook to see pictures throughout the actual school day. Today at Mass, Father Wrightson reminded the children of the story of Jesus reuniting with His friends after the Resurrection. He spoke about how Jesus helped his disciples to bring in more fish then they normally would. When his friends came to shore, Jesus had a fire going, ready for them to have breakfast together. During his homily, Father Wrightson asked the students who would want to have a breakfast of fish, and very few students agreed that is what they would enjoy instead of cereal. He was able to point out that Jesus may not always give us what we want, but he does give us what we need. And some exciting news, we received our new 75 inch Smart Monitor earlier this week and are working to install it in the 21st Century Digital Library so it can be used next week. The monitor can raise and lower to accommodate any of our student groups with the touch of a button. The monitor requires no expensive parts and will serve St. Anthony’s for years to come. Think of the Smart Monitor like a large iPad that allows students to touch and interact with it. Congratulations to our March Students of the Month! March’s virtue was mercy. Congratulations to Emma Matarese (PK 3), Wen Wen Chen (PK 4), R.J. Kowalski (K), Raphael Arias (1st), Adrian Ortiz (2nd), Abby Beals (3rd), Lakeves Laws(4th), Alessandra Marte (5th), Brianna Ramos (6th), Emily Anderson (7th), and Cara Quinlan (8th)! Congratulations and God Bless Nadia Black (8th) and Rebecca Baker (2nd). Nadia was Baptized into our Catholic faith and Rebecca received the sacrament of First Reconciliation. May the Lord bless you both. Congratulations to the following Community Builders: Norma Cole, Pam Morabito, and Nicholas Ferrara. On Friday, April 27th, we will honor these community builders at our regular 8:00 A.M. Mass. Norma Cole was a Math teacher here for many years. She was instrumental in starting Student Council. Pam Morabito has served on many boards and currently serves as President of YAC (Youth Activities) and also serves on our Parish Finance Council. Pam has been a coach for many years, continuing long after her own son graduated. Nick Ferrara has been a supporter of the grade school for as long as I can remember. He has helped us with generous monetary contributions over the years, to support new and innovative ideas like our computer lab and most recently our digital library. We will be celebrating the lives of these three fine individuals for their dedication to our parish school community. They have given of their time, treasures, and talent, and we are extremely grateful for their kindness and generosity. Congratulations to Mrs. Nancy Burris on the birth of her grandson, Ethan Patrick Burris! We can’t wait to meet him! Please join us on Saturday, April 14th for the Phil Rendina Discretionary Education Fund Dinner. This dinner will be themed “Flashback to Little Italy.” There will be a Mass of remembrance at 5:30 P.M. in Church followed by dinner in the Ballad Room. Come and enjoy a dinner of Gerardo’s Pizza, subs from Capriotti’s and Casapulla’s, and Bernie’s water ice. Have fun with flash back photos, music, dancing, and much more. All proceeds go directly to our grade school that Phil loved so much. Contact Pam Morabito at pamtrego5499@gmail.com for more information and tickets. Come join our Antonians for an Evening of Sacred Music at St. John the Beloved on Thursday, April 19th. All Antonians are invited and encouraged to attend this event. It is a beautiful evening with samples of music from all of the Catholic elementary schools in the Diocese. More details will follow under separate cover. Antonians are asked to arrive at 6:15 in school uniform. The program will start promptly at 7:00 P.M.
April 12th – atTAcK addiction – 6th/7th Grade – 11:30 A.M.
Phil Rendina Discretionary Education Fund Dinner – Ballad Room – 6:30 P.M.
April 16th – Mark High School Visit – Middle School – 1:30 P.M.
April 18th – YAC Meeting – Ballad Room – 6:00 P.M.
April 19th – Evening of Sacred Music – St. John the Beloved – 7:00 P.M.
Last week Bishop Malooly and Dr. DeAngelo (our superintendent) came to visit us. They met with PreK 3 to 4th grade in the school gym and 5th – 8th Grades in the Ballad Room. After meeting with the larger groups, the 8th graders took Bishop Malooly upstairs and gave him the tour of our updated Digital Library. Bishop Malooly was very impressed. While meeting with each group, Bishop Malooly took time to ask students what they were learning in class, specifically Religion and Social Studies. He also discussed our yearly theme, “To Jesus through Mary” and discussed the virtue for the month of March, which is mercy. At the end of his meetings, Bishop Malooly prayed the Memorare with each group, gave them a blessing, and assigned them a little bit of homework. They were to go home and thank you, their parents, for sending them to a Catholic school. I would also like to thank you for sending your children here. It is a joy and privilege to see all of these boys and girls, young men and women, learn and grow in their knowledge and their faith. Thank you for choosing St. Anthony’s! Congratulations to our February Students of the Month! February’s virtue was faithfulness. 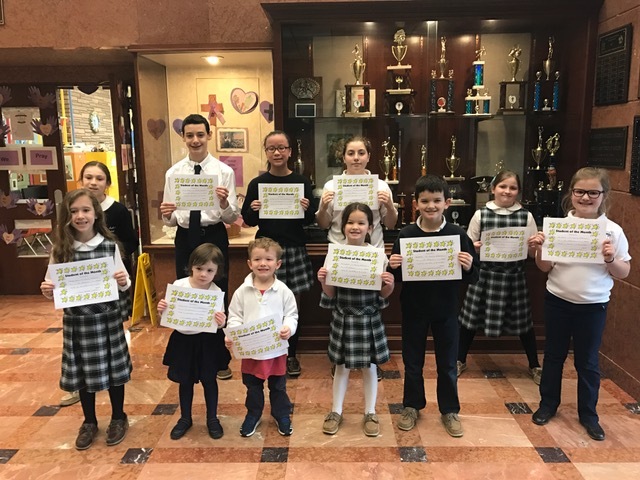 Congratulations to Amelia Stellini (PK 3), Matthew Spinelli (PK 4), Amber Matarese (K), Delaney Loyola (1st), Nora Farrell (2nd), Jacob Matarese (3rd), Kendall Reilly (4th), Natalia Alfieri (5th), Eva Pellegrino (6th), Chelsea Lam (7th), and Henry Kelleher (8th)! 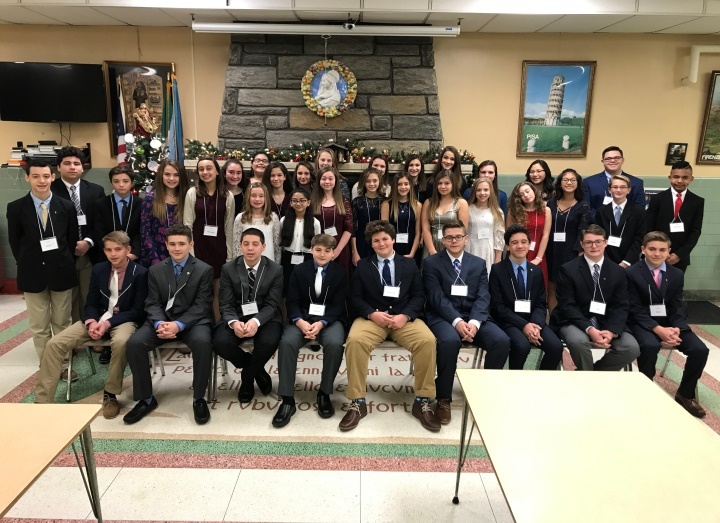 Bishop’s Pilgrimage – On Saturday, March 24th, Mr. Limmina and Mrs. Tannenbaum will lead a group of our students during the Bishop’s annual pilgrimage. Current students Hannah Fagioli, Allen Martin DelCampo, Madison Rieger, Jessica Rieger, Vincent DeLuca, Eva Pellegrino, and Avara Lingerfelt, as well as former student Danny Piergalline, will participate in this Pilgrimage led by Bishop Malooly. The Pilgrimage commemorates Jesus’ triumphant entry into Jerusalem on Palm Sunday and his own pilgrimage to Calvary on Good Friday. Thank You, Thank You, Thank You — The 8th Grade Class would like to say thank you so very much to everyone who came out to support their Lenten Pasta Dinner. Considering how bad the weather was that evening, they greatly appreciate all those that braved the elements to come enjoy their Pasta Dinner. Thanks to all those who participated, bought to-go orders, or even just made a donation. Your generosity is greatly appreciated and made this event a great success. Congratulations to Henry Kelleher! Henry will represent St. Anthony’s in the Delaware State Geography Bee in April. Good luck, Henry! Congratulations to Evan Cillo and Dylan Farrell! Evan and Dylan represented St. Anthony’s at the Knights of Columbus Chess Tournament. The team won 3rd place in the K-6 division and Evan won 4th place in the 6th Grade section. Way to go, boys! Book Fair News – Our Scholastic Book Fair will run from March 19th to March 25th in the Ballad Room during school hours and on Palm Sunday in conjunction with the annual parish Easter egg Hunt. Each class will have a scheduled time to come shop at the Book Fair. Scroll down the page to “ewallet.” Follow the instructions to load allocated dollar amount onto your student’s ewallet. Payment may be made using a credit card. Print out the ewallet sheet and your student is ready to shop. The “ewallet” print out must be presented at the time of check out. This is not the only form of payment. We will still accept cash, checks, and credit cards. Casino Night – Come join our Home and School Association for their 3rd Annual Casino Night on Saturday, March 10th from 7:00 – 11:00 P.M. in the school gym. Tickets cost $35 and include $50 in playing chips, heavy appetizers, as well as beer and wine. Games include blackjack, craps, and roulette. All attendees must be 21 or older. Proceeds will benefit St. Anthony’s Digital Library Project. To purchase tickets (all ticket sales are final, no refunds) or for more information, please contact Elizabeth Alfieri at escorsone@hotmail.com. Congratulations to Javier Lorenzo! Javier is a freshman at Salesianum and is currently ranked number 1 in his region for Math League. Amazing job, Javier! Parish Easter Egg Hunt 2018 – The annual Parish Easter Egg Hunt will be held on Palm Sunday, March 25th, after the 11:00 A.M. Mass (approximately 12:30 P.M. start time) in the Ballad Room. Categories are: up to age 2, ages 3-5, ages 6-10. There is a prize basket for each age category. Also a special appearance by a tall character with floppy ears is scheduled! Enjoy the full array of delicious refreshments offered at parish socials (Serpe’s donuts and tomato pie, Degnars’ breakfast pizza, and much more)! Please RSVP with number of children, children’s names and ages, and a contact phone/e-mail by Thursday, 3/22/2018. Please RSVP to Anthony Albence via e-mail to cua20064@aol.com or via phone to (302) 983-3200. (Please leave voicemail with info if no answer.) Include child name, age, parent name, and email/phone number. AGAIN THIS YEAR: all participants and their families are invited to attend the 11:00 A.M. Mass, where if you bring your Easter Baskets to Mass they will be blessed. ALSO RETURNING THIS YEAR: The annual Scholastic Book Sale benefiting the Grade School library will be open during the event. A perfect place to pick up an Easter gift that will also help our school! March 12th – First Holy Communion Meeting – Ballad Room – 6:15 P.M.
7th Grade Confirmation Meeting – Ballad Room – 6:00-8:00 P.M.
March 24th – Bishop’s Pilgrimage – 7:00 A.M. – 4:00 P.M.
Today at Mass, we celebrated to Feast of the Presentation of Jesus, when Jesus was presented in the temple. Father Wrightson had a beautiful message about Jesus being the “light of the world” for us. Jesus passed this light onto each one of us. Now we are called to be the light of the world, and we are asked by Jesus to continue in his name by being a light for others. Father reminded us to be nice to others, go the extra mile, and be the best we can be. He told us we should be the light for one another in a world that so desperately needs it. As our Eighth Grade prepared today’s Mass and had many “last” events here at St. Anthony’s this week, I could not help but feel very hopeful about our world. If these young, faith-filled, tolerant, and kind students are any reflection of the light we are sending out into the world, I do believe we have a lot to look forward to. Father said that Catholic Schools Week is not just a week, but a chance to spread the light of the world beyond this week and into the world for the rest of this year. This week has been a very exciting week for our school and Catholic schools across the country as we celebrate Catholic Schools Week. The theme for Catholic Schools Week is “Catholic Schools: Believe. Learn. Serve. Lead. Succeed.” These 5 words are important to every Catholic school, and here at St. Anthony’s we try (and succeed) to live up to them. When a new family comes to tour the school or a new student starts, a consistent comment made is the sense of belonging and family they feel here. The teachers and staff work hard to make sure all students are learning and succeeding at their level in the classroom. Service is something we work on here, whether it is from activities like drawing pictures and cards for people in nursing homes, collecting socks or food for those in need, or having dress down days to benefit the Childhood Missions. Part of the fun for the students comes from the different events and activities that happened this week. Monday was Go Orange Day and we also held our Knowledge Bowl. Our students came out in full force with their orange gear (and so did our teachers!) It was wonderful to see so much school spirit on the first day of Catholic Schools Week. In the afternoon, we held our Knowledge Bowl. I was thoroughly impressed with all the questions our students were able to answer and how much they’ve learned so far this year. What an amazing job! Tuesday was Twin Day. Not only did we have twins, we also had triplets and quadruplets. It was stunning to see the lengths our students went to so they could match with their “twin.” Tuesday was also Teacher Appreciation Day. Thank you to our Home and School Association for the delicious lunch they provided to our teachers. Another thank you goes to our Student Council who provided some delicious breakfast treats to our teachers Wednesday morning. It was enjoyed by all. Wednesday was Spirit Day. Mrs. Orensky put together a great set of activities appropriate for the different grade levels, and our 8th Grade class did a great job helping during these periods so everything ran smoothly. The scores were very close, but at the end of the day, the Black team came out on top. Thursday was Student Appreciation Day. The whole student body went to Penn Cinema to see the movie “Ferdinand.” Our generous Home and School Association paid for the movie and snacks for everyone to enjoy. I can safely say everyone had a great time at the movies. Today was the annual 8th Grade vs. Parents Volleyball Game. At the time of writing this the game had not been played, but be sure to check our Facebook page to find the results. Thank you for your generosity in donating to our “Soup-er” Bowl! Our families are so giving to others in need. In additional exciting news, this year is our year to host our Italian guests, as part of our Olevano, Italy, Sister Cities Project. For those of you that are new to our school community, every other year we send 2 to 4 families to Italy to stay with host families. This is an amazing trip. I had the pleasure of going with my daughter when she attended school here. Everything, except the plane ride, is covered by the program. It is typically 10 days and nights in beautiful Olevan sul Tusciano, Italy. The city of Olevano is the sister city to Wilmington, where many Italian immigrants traveled from several years ago. Many of those immigrants are the workers that built our parish. We are looking for host families here in our parish. Hosting really means simply providing lodging. The program is extremely action packed. There are places set up for you to take your family (or send them without you). The committee plans the itinerary. You simply go along for the ride. Everything is paid for. Meals and special events/tours are included. You may have to occasionally have coffee or a pastry in the morning, but that would be the extent of it. They typically do not eat breakfast. As you can see I am excited about this possibility rolling around again. Typically it is held during the school year. This year, the program should run from June 8th through the following week. They would like to be here to be a part of our Italian festival. Please consider hosting! If you host a family, you get to experience Italy the following year. Olevano is a small town on a mountain. I can’t even begin to describe its beauty and the warmth of family that you will encounter. You will stay in Italy and travel with the other school families (typically 2-3 families, possibly more). You see the sights, learn the culture, enjoy the food, and are treated like absolute royalty. The government there welcomes you and the people of the town are instant friends for a lifetime. No words can express the joy and fun we experienced. You do not need to speak Italian. They have translators, and the children will entertain you with Google translate (not always literal, but definitely comical). We alternate years for traveling. Our students and parents go to Italy one year, and then they come here the following year. Typically one parent and child make the trip, but entire families are welcome to go. I hope you consider hosting a family. It is definitely worthwhile! Please contact me if you have any questions. 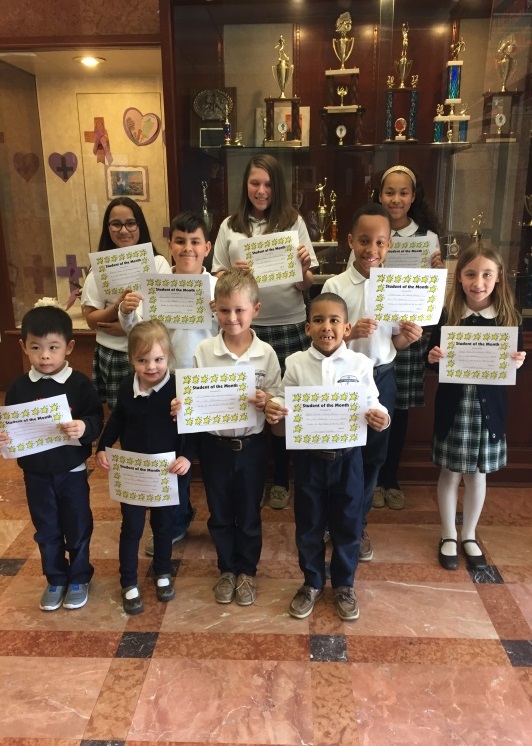 Congratulations to our Knights of Columbus Essay Winners! – Congratulations to Caitlyn Kowalski (5th), Jack Aloi (6th), Neha George (7th), and Gracie Hillis (8th). Each grade had a different essay topic to write about and these students’ essays will be going to the state competition. Congratulations to our January Students of the Month! January’s virtue was “wisdom.” Congratulations to Mason Knoff (PK3), Iago Ramos (PK4), Noel Pulliam (K), Desmond Denny (1st), Jessica Garcia (2nd), Nathan Minor (3rd), Colin Hannan (4th), Richie Jakotowicz (5th), Connor Quinlan (6th), Neha George (7th), and Leah Rizzo (8th)! Keep up the good work! Aftercare Sign-out Procedure – For the safety of our children, the two-step sign out procedure for Aftercare must be followed. First, a parent or authorized adult must stop at the school office and sign the sign-out sheet. Second, the parent or authorized adult must physically go down to the Aftercare room to get the child. This step provides a second measure of safety for the children in that the Aftercare staff will visually identify the adult who is taking charge of the child. Parents and other adults are not to text their children and tell them to meet them in the lobby or to leave the building and go to the adult’s car. Failure to comply with this procedure will result in losing Aftercare service.
. If you would prefer to send in cash or check orders, please send $30 in an envelope with your child’s name, grade, and Attention Ms. Palmer. Checks should be made out to St. Anthony of Padua School. Padua Academy’s Musical Theater Program will be performing “The Addams Family” on Friday, 2/16, and Saturday, 2/17, at 7:30 P.M. and on Sunday, 2/18, at 2:00 P.M. If you are interested, tickets can be purchased at the door for $10. For further information, please contact Lisa Kowalski at lkowalksi@paduaacademy.org. February Social – Our next parish social will be held on Sunday, February 4th, in the Ballad Room of the Grade School, following the 9:00 A.M. and 11:00 A.M. Masses. Our Antonians will be singing this Sunday. Stop by for food, fun, and socializing with fellow parishioners and friends. The social, as always, will feature a variety of great treats from Serpe’s Bakery, delicious breakfast pizzas from Degnars Greenhill Deli, and a variety of foods.
) for upcoming events and information. Also like our Facebook page to see more photos from our events. 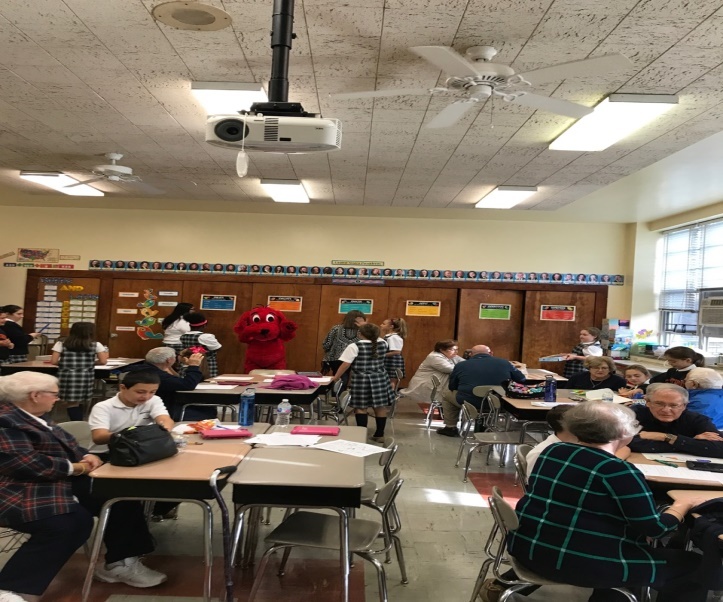 February 5th – Student Council Meeting – Preschool – 3:00 – 3:30 P.M.
February 8th – 1st Grade Field Trip – Cab Calloway – Seussical, Jr.
February 12th – Math League at St. Anthony’s – 3:30 P.M.
Grotto’s Night – Pennsylvania Avenue – 4:00 – 9:00 P.M.
February 15th – School Spelling Bee – Gym – 1:30 P.M. Happy New Year to all of you! I hope everyone had a calm and blessed Christmas with your families and friends. As we begin this new year in school, we are celebrating the virtue of “wisdom” for the month of January. Today’s readings reminded us to use our wisdom by taking time to quiet ourselves and open our minds and hearts to listen for God and see if He is speaking to us. We will continue our journey to Jesus through Mary as we teach and learn about the Luminous Mysteries during the month of January and continue praying the Memorare as a school community daily. We are looking forward to an amazing 2018 filled with fun and educational opportunities at St. Anthony’s. Catholic Schools Week is coming very soon. This is such a wonderful week when we get to celebrate everything that makes us the unique environment we are and the people who make us so successful. We strive to help all our students grow to be faith-filled, spiritual, confident, loving individuals that will go on to share their talents we have nurtured with the rest of the world. We will be sending information home on Wednesday about the events and schedule for Catholic Schools Week. I hope we see you during Catholic Schools Week! There is no school Monday, January 15th in celebration of Dr. Martin Luther King, Jr. Day. Friday, January 19th – Next Friday, January 19th, there will be a blood drive in the school gym from 7:30 A.M. – 12:30 P.M. Information was sent home last week. This day is also a NOON DISMISSAL for all students. THERE WILL BE NO AFTERCARE. St. Anthony’s Open House is Sunday, January 21st from 12:00 – 3:00 P.M. Please spread the word! You are our best marketers. Our school family continues to grow because of all of you. No amount of marketing can replace good, old-fashioned word of mouth (and your personal social media). Thank you for helping us to grow. If you have time, please stop by to check out the Library project, which is well on its way to being the 21st Century Classroom we were hoping for. Cyber Snow Days – We have already had 2 snow days in the new year so far and can expect that more should happen. Any day that school is closed due to snow/ice/weather conditions, it is considered a Cyber Snow Day. Teachers will have work on their school websites or may send a packet home. Your child has one week from the date of the snow day to complete the work. If the work is not turned in, your child will be considered absent for that day. Congratulations to our December Students of the Month! 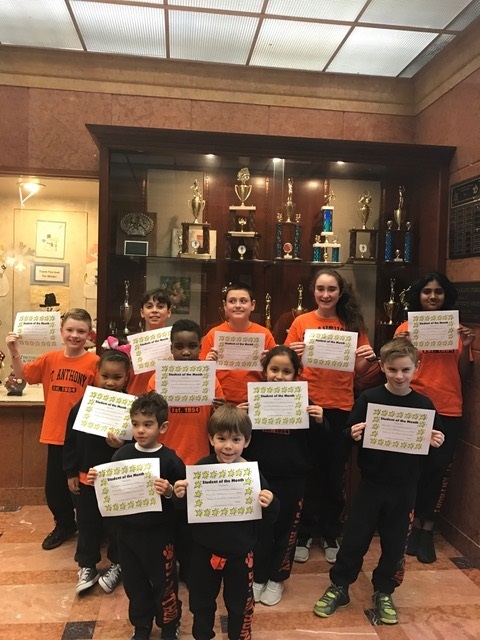 December’s virtue was “joy.” Congratulations to our joyful students: William Jeppe (PK3), Skye Livingston (PK4), Gavin Fax (K), Jun Chen (1st), Emmanuel Harris (2nd), Gillian Patterson (3rd), Lena Padovani (4th), Angel Rizzo (5th), Arianna Marchione (6th), Vinny DeLuca (7th), and Isabella Ceresini (8th). Keep it up! Please consider joining us tomorrow, January 13th from 6:00 – 11:00 P.M.! The parish will hold a Beef and Beer to offset the remaining cost of the Mercantini bathroom remodel. This event will be held in the Ballad Room (cafeteria). Tickets are $35.00/person and are available for purchase in the main school office. Food, beer, and wine are included. A cash bar will also be available. This adult (21 and older) event is sponsored by St. Anthony’s Holy Name Society. 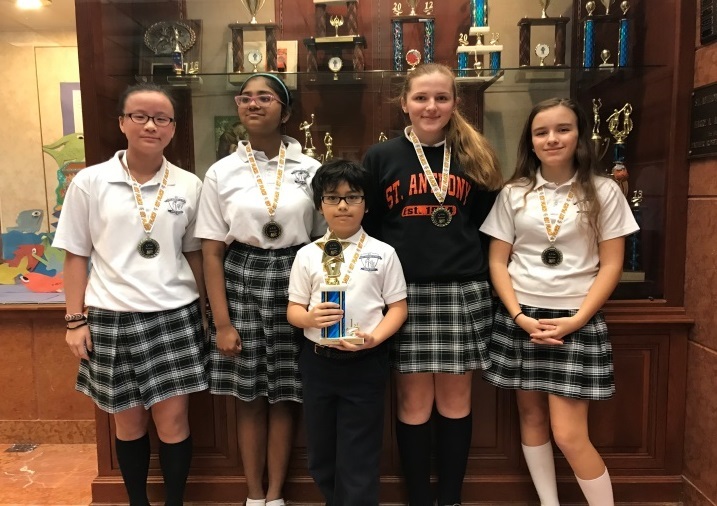 Math League Update – Our 7th Grade Math League team is in 2nd place in our region. We compete against Brandywine Springs, Cab Calloway, and St. John the Beloved. Andres Lorenzo has the highest score in the region and he is in 1st place in the individual standings. Congratulations to all Math League participants! Saturday, January 13th – Beef & Beer benefitting the Mercantini Family – Ballad Room – 6:00 – 11:00 P.M.
Wednesday, January 17th – YAC Meeting – Ballad Room – 6:00 – 7:00 P.M. Blood Drive – School Gym – 7:30 A.M. – 12:30 P.M.
Sunday, January 21st – Open House – 12:00 – 3:00 P.M.
Monday, January 22nd – Student Council Meeting – PreSchool – 3:00 – 3:30 P.M.
Sunday, January 28th – Catholic Schools Week Opening Mass – 11:00 A.M. Please be sure to follow us on Facebook! I realize we have repeated this information many times, but our Facebook page is where we will be putting most of our information from now on. It is updated regularly with school news, information, and updates to our calendar. We will post all school closing information on the school Facebook page. If you haven’t followed us yet, look for St. Anthony of Padua Grade School Families, Alumni & Friends. Last Saturday our 8th Grade students made the Sacrament of Confirmation. I am so proud of this 8th grade class. I received so many compliments about their preparation, behavior, reverence, and comradery with our parish PREP class. I even had the pleasure of receiving a complimentary call from Bishop Malooly himself on Tuesday. It truly made my day. I have to admit I was a bit nervous when I was told our Bishop was on the phone for me. It is not every day that you receive a call from his office. I instantly felt like a child getting called to the principal’s office. It meant a lot to me that he would take the time out of his busy day to share a positive experience he had on Saturday with one of our students. It was a beautiful time of year for this sacrament. Snow was falling, and there was an excitement in the air. Our students received the Seven Gifts of the Holy Spirit: Wisdom, Understanding, Counsel, Fortitude, Knowledge, Piety, and Fear of the Lord. Bishop Malooly reminded us to be the “Face of Jesus” for others and to spread our joy through our facial expression. God has been good to us, and therefore, we should advertise our faith through our faces. He shared his simple yet very important message to “Smile, Pray, and Serve!” He asked that we all do this every day. He encouraged us to talk to Jesus who is always with us. He reminded us to serve others as Jesus did and to do so with a smile. I will leave you with this thought as we enter the Christmas season. I hope to see all of you in our school gymnasium for our Christmas Program on Friday, December 22nd at 10:00 A.M. This will be a noon dismissal with no aftercare provided. God Bless our Confirmandi! Blake Patrick Bowers, Luke Francis Burdett, Isabella Margaret Ceresini, Gisella Lucy Diaz, John Antonio DiOssi, Hannah Bernadette Fagioli, Jenna Natalia Giannattasio, Gracie Lucy Hillis, Henry Xavier Kelleher, Samantha Claire Lobozzo, Edward Christopher Loyola, Allen Valentina Martin DelCampo, Joseph Michael Mazalewski, Lauren Marie McLaughlin, Carlita Martina Prado, Cara Philomena Quinlan, Stephen Patrick Reynolds, Madison Lucia Rieger, Leah Teresa Rizzo, Donovan Mark Sarver, Hayden Dominic Scully, Jayden Claire Slattery, and Thomas Pio Vadden. Congratulations to our Declamation Contestants! 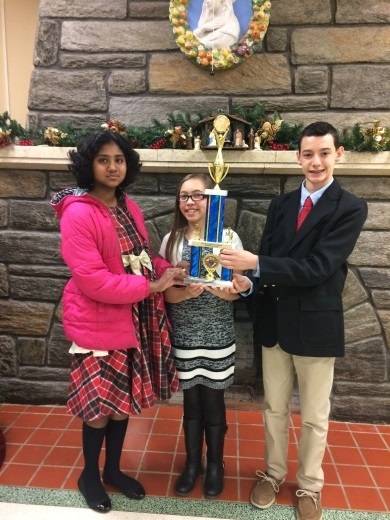 Henry Kelleher (8th), Neha George (7th), and Elliana Godlewski (5th) represented us very well in the Knights of Columbus Declamation Contest. We won Third Place for all schools in the contest. Our speakers did an amazing job! I had the pleasure of hearing their speeches prior to the special day. Way to go, students! Report Cards came home on Wednesday! Please check your child’s book bag. Report cards were sent home on Wednesday in a separate envelope from all other communications. PLEASE SIGN AND RETURN the envelope as confirmation that you did receive the report card. There will be no Honors Assembly this marking period due to our Christmas Program being held on December 22nd and there being no Mass that day. Christmas Show – Our annual school Christmas show is next Friday. The show starts at 10:00 A.M. and is always extremely well attended. Friday is a DRESS UP DAY for all students. Please be sure to follow the school dress code rules. No boots, open-toed, or open-backed shoes are allowed. Congratulations to our graduates who earned Honor Roll for the First Marking Period in their high schools! First Honors: Seniors Justin Brooks, Andres Fabris, James Mazalewski, Taylor Oden-Randolph, and Nathan Thomas; Junior Daniel Borowski; Sophomores Sadie Falcone-Testardi and Ben Pfeil. Save the Date for January 9th for a Pallet Painting Party! – Join our Home and School Board as they host a Crimson Pallets painting party. This will be held in the Ballad Room (cafeteria) at 6:00 P.M. A flyer was sent home on Wednesday. Register now! Space is limited! Save the date for January 13th from 6:00 -11:00 P.M.! The parish will hold a Beef and Beer to offset the remaining cost of the Mercantini bathroom remodel. This event will be held in the Ballad Room (cafeteria). Tickets are $35.00/person and are available for purchase in the main school office. Food, beer, and wine are included. A cash bar will also be available. This adult (21 and older) event is sponsored by St. Anthony’s Holy Name Society. Monday, December 18th – Student Council Meeting – PreSchool – 3:00-3:30 P.M.
Friday, December 22nd – Christmas Show – Gym – 10:00 A.M.
Monday, January 8th – Student Council Meeting – PreSchool – 3:00-3:30 P.M.
Tuesday, January 9th – Pallet Painting – Ballad Room – 6:00 P.M.
Wednesday, January 10th – Home & School General Meeting – Ballad Room – 6:30 P.M. I wish everyone a blessed and peaceful Christmas vacation. Thank you as always for sharing with us your most precious gift from God, your child/children. It is our pleasure to smile, pray, and serve them every day! 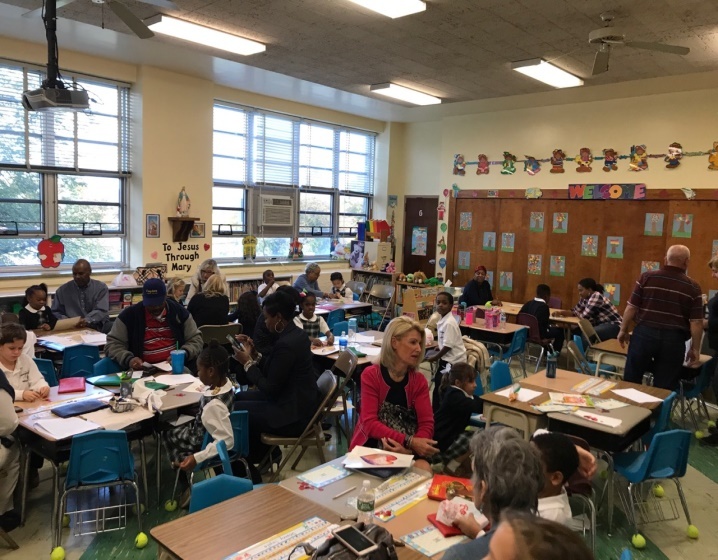 Grandparents’ Day – Thank you to everyone for inviting grandparents and special people to Grandparents’ Day! The day was wonderful with the halls and classrooms filled with smiling and proud grandparents. Children were thrilled to share their work, snacks, games, and time with their special people. We had a lovely prayer service, and Father Nick told the children stories about his own grandmother. The Antonians sang independently this time, without the leadership of Mr. Colligan, and they did an excellent job. At the end of the prayer service, Student Council officers had their induction ceremony and all representatives and alternates received their Student Council pins. We had the Scholastic Book Fair going on throughout the day, and Clifford the Big Red Dog was here to visit students and classrooms. I want to give a special thank you to Mrs. Lynn DeLuca, Mrs. Melissa Farrell, and Mrs. Giovanna Ortiz for hosting a beautiful reception in the Ballad Room. There was a delicious buffet of breakfast treats, pumpkin spiced latte, and an adorable photo opportunity. I shared with the grandparents all of the great things happening here at our school. They were excited to hear that our school is thriving, our library was being transformed, we are 22 students above budget, and we have a growing staff. To see more pictures from Grandparents’ Day and all upcoming events, please follow us on Facebook. You can find us as Anthony of Padua Grade School Families, Alumni & Friends. Priesthood Sunday – Today we visited the rectory to drop off Spiritual Bouquets for our priests. Each student made a card for one of our priests to thank them for their dedicated service. Students did a very nice job decorating the cards, saying Rosaries for our priests, and sharing notes of support and gratitude. We are blessed to have such wonderful role models for our youth. This Sunday is Priesthood Sunday. Please take a minute to thank our priests for all they do for us. We really are fortunate to have these gentlemen in our midst. Congratulations to our Varsity Girls Volleyball Team! We are pleased to announce that our Varsity Girls team has such a fantastic record this year (first place in their division) that they have advanced all the way to the semi-final game on their way to a Championship. The girls will play in the semi-final game on November 4th at 10:00 A.M. at the Sanford School. When the girls win that game, they will advance to the championship game on Sunday, November 5th at 1:15 also at the St. E’s Center at St. Elizabeth’s. Pick-up Safety/Parking reminders – This week, we witnessed two children almost get hit by a car because people were in such a hurry. Please slow down! Please do not park on the city sidewalks when waiting to pick up your children. Use the parking lot and the four city blocks that surround our campus. Across the street is a city bus zone. Please do not park in it. It is a parking violation, and you can be ticketed. Also, remember in the morning to please pull forward as far as possible when dropping off a child. Do not park your car in front of school if you plan to exit the car, even if simply walking your child into school. This creates a traffic jam and safety issue. If you will be exiting your car, please park it somewhere other than our drop-off zone in the front of the school. Halloween party tonight! – I hope to see everyone there tonight from 6:30-8:30 P.M. This is always a very well attended event. I just want to remind parents that our Haunted House is “haunted.” Our 8th Grade students have worked very hard to create a scary and fun activity that is intended for the older students. There will be a clown inside of the house. Please use your discretion when letting small children enter. The rest of the event is geared to the younger students. Face paint and TEMPORARY hair dye is allowed. No masks, blood, weapons, or gore is allowed. Any student not following these rules will be calling home to have their uniform brought to them. Join the Bishop’s 5K Run/Walk – On Saturday, November 18th, Catholic Charities and the Diocese of Wilmington will be holding a 5K Run/Walk in Bellevue Park with a start time of 10:00 A.M. Visit https://www.bishops5k.com for more information or to register. Altar Servers – The parish is looking for more altar servers. Altar servers must be in grades 5 and up. If your child is interested, please be sure to have them notify their homeroom teacher. All altar servers, new and old, will be going through some training classes in the upcoming months. More information will be available soon. November Parish Monthly Socials – Please join us for the November monthly parish socials to be held on Sunday, November 5th after the 9:00 A.M. and 11:00 A.M. Masses in the Ballad Room of the grade school. Enjoy a variety of great food, including tomato pie and donuts from Serpe’s Bakery, breakfast pizza from Degnars Greenhill Deli, and other delicious food selections including mini-bagels and fresh fruit while catching up with fellow parishioners and friends. Hope to see you there! Sunday, October 28th – Open House at St. Mark’s – 12:30 P.M.
Open House at Archmere Academy – 12:30 P.M. Math League Practice – Middle School – 3:00-4:00 P.M. Girls on the Run – 3:00 – 4:15 P.M.
Wednesday, November 1st – All Saints Day Mass – 8:00 A.M.
Thursday, November 2nd – Girls on the Run – 3:00 – 4:15 P.M. Varsity Girls Volleyball Semi-Final Game – Sanford School – 10:00 A.M.
Sunday, November 5th – Open House at Salesianum – 12:30 P.M.
Open House at Sts. Peter and Paul High School – 1:00 P.M. Varsity Girls Volleyball Championship Game– St. E’s Center at St. Elizabeth’s – 1:15 P.M.
Monday, November 6th – Student Council Meeting – PreSchool – 3:00 – 3:30 P.M.
Tuesday, November 7th – Math League Practice – Middle School – 3:00- 4:00 P.M.
Wednesday, November 8th – Grotto’s Pizza Night – Pennsylvania Ave. – 4:00-9:00 P.M.
Thursday, November 9th – 5th Grade Field Trip – Franklin Institute – 8:30 A.M.-2:30 P.M.
Home and School Designer Bag Bingo – Gym – 7:00 P.M.
Sunday, November 12th – Open House at St. Thomas Moore – 12:00 P.M.
Monday, November 13th – 8th Grade Confirmation Meeting – Ballad Room – 6:15 P.M.
Tuesday, November 14th – Girls on the Run – 3:00 – 4:15 P.M. Spirit Night –Chipotle on Kirkwood Highway – 4:00-8:00 P.M.
Thursday, November 16th – Girls on the Run – 3:00 – 4:15 P.M.
Monday, November 20th – Student Council Meeting – PreSchool – 3:00 – 3:30 P.M.